We’ve all done it. Filled a pot with compost, grown a seed or planted a plant – all with the best intentions. Then a few weeks later, you notice that tomato plant is looking straggly, the leaves have wilted on the peppers and one or two fruits are looking less than happy on bare stems. What went wrong? Maybe you have a busy work schedule and get home every evening too tired to bother with watering your plants, or perhaps you just simply forget to check them. You want the benefits of eating nutritious home-grown produce, but each time you try, it never quite works out. Here is a list of the top 5 easiest garden produce to grow that will give rewards, even with just a little bit of care. 1. Herbs – Herbs are great plants to grow if you’re a super busy person. Most will grow quite happily in some well drained soil. Herbs like mint will really thrive just planted in the garden, so get ready for an endless supply of fragrant mint to use in all sorts of culinary delights! 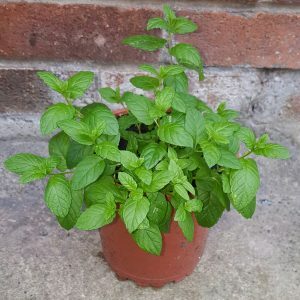 The easiest way to grow mint is to plant it in a roomy pot or fabric planting bag, and then plant the lot into the garden soil. This stops the plant from spreading too far and reduces the need for watering as moisture will make its way to the roots from the surrounding soil. 2. Strawberries – plant them in a pot or into your garden. Potted strawberry plants will need more watering though! Watering well when you remember is better for the plant than just giving a little water every day. Young plants bought in April will fruit in just a few weeks, but they actually produce the best fruit in their second season, so with little effort you will soon be picking plenty of fresh strawberries to enjoy in the summertime. 3. Rootcrops – Rootcrops such as onions, radishes and beetroot are also good ‘set and forget’ plants. Onions – In springtime, buy onion sets, which look like small mini onions, and plant them 4 inches apart. Water well. Again, it is better to give them a good drink when you remember than giving a little each day. By late summer, they should be ready to harvest and store. Beetroot – an easy crop to grow, beetroot seeds can be sown into garden soil in rows, from March to July. Thin the seedlings out a little when you have time, and leave the rest to grow. Harvest them in late summer. Radishes – The peppery taste of a fresh radish spices up many dishes such as salads and coleslaw. Growing radishes is easy to do, and they are a quick growing crop, so you will be able to enjoy a harvest in just a few weeks. There are lots of radish varieties, producing radishes of different shapes and colours. Radish leaves can be eaten, and they are very nutritious. The leaves do become hairy as the radish plants mature, so mature leaves are more pleasant to eat when cooked. 4. Spinach – Spinach is a leafy green that is easy to grow and very nutritious if grown organically. There are two types of spinach plant, some are sown in springtime and some are sown in autumn. Sow seeds in a pot, keep moist and watch it grow! Pick leaves when they are a good size for eating. 5. Perennial Fruit Bushes – black currants, red currants, gooseberries. These fruit year after year and once established are very easy to maintain. Plant into garden soil for best results and minimal watering. Even the busiest of people can eat food they have grown themselves. It’s about choosing to grow the right produce to suit your lifestyle, and with minimal effort and a bit of watering here and there, you will find it a fresh and tasty success.